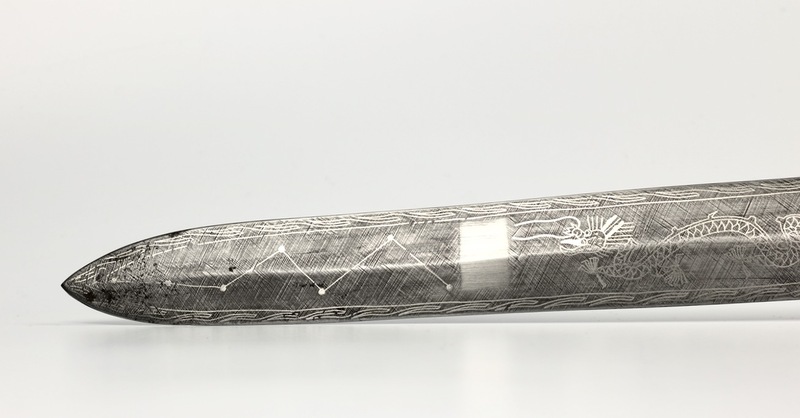 This sword is part of a group of very similar swords. Some are shorter double swords, other single swords, some large, like this one. 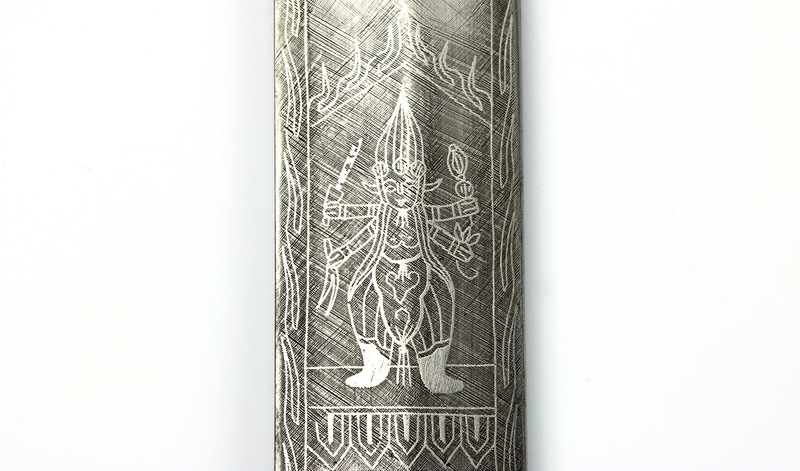 What they all have in common are blades with extensive overlays in silver, sometimes also with copper and brass. 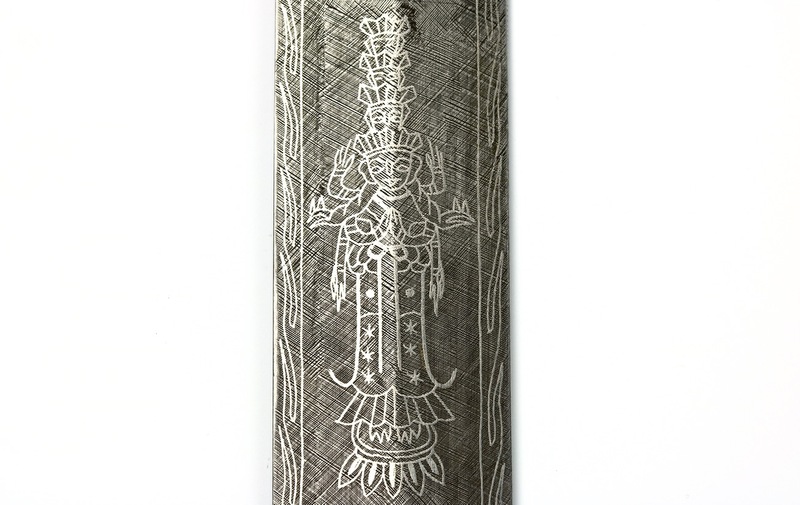 The decor always incorporates figures, sanskrit symbols, constellations, and a reign mark, all contained within a framed border following the contours of the blade. The reign mark is in zhuanshu (seal script) that says 大清乾隆年制 ( Da Qing Qianlong nian zhi ) or "Great Qing Qianlong Period Manufacture". The Qianlong emperor's long reign lasted from 1736-1796. When looking at the style and workmanship of the swords in this group however, they seem to date to the late 19th to early 20th century. More specific, probably around 1890 - 1920. 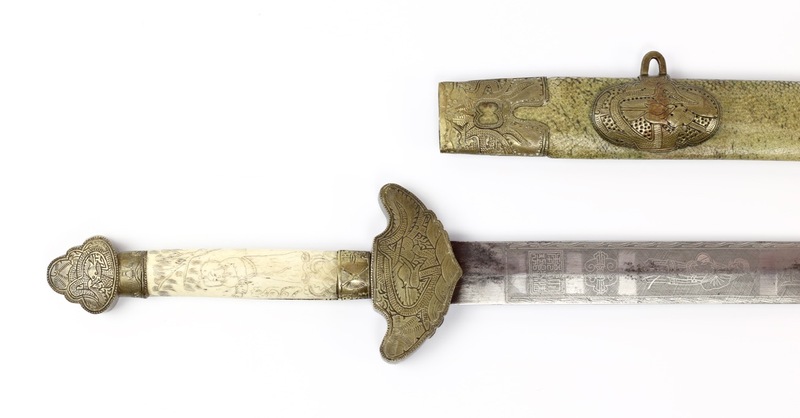 The Royal Armories sword in Osprey's Late Imperial Chinese Armies 1520 - 1840. Our sword is laid out on top of the book. 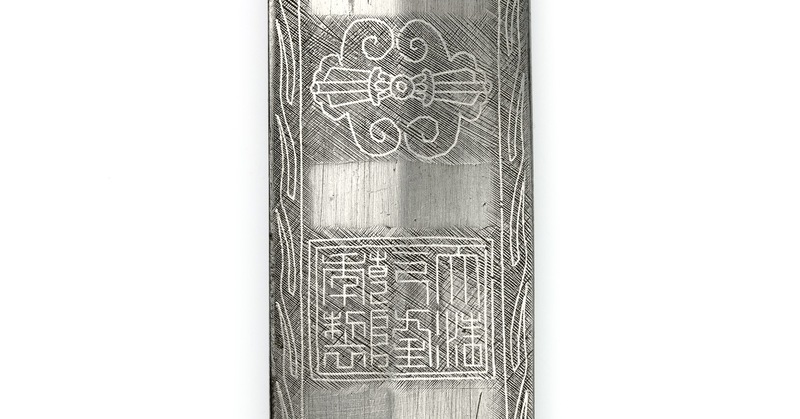 It is rare to find a reign mark on an antique Chinese weapon, let alone one that doesn't correspond to its date of manufacture. It is not without precedent, though. 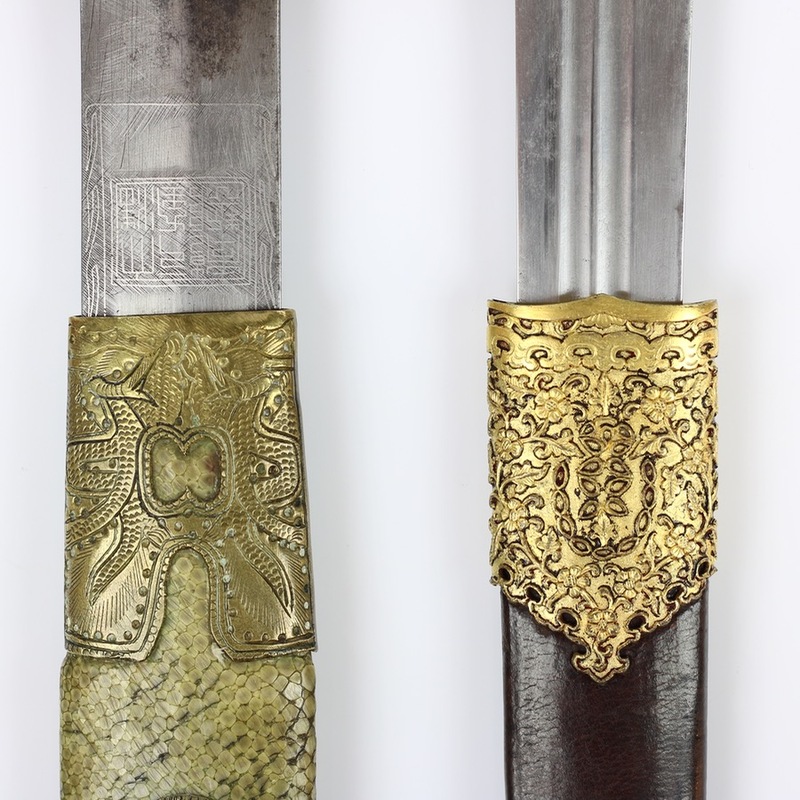 Some 19th century rebel groups marked their weapons with Ming dynasty reign marks, harking back to the last period the Han were ruled by Han, and not by Manchus as had been the case in the Qing from 1644 onwards. It was an act of rejecting the present Qing, and idealizing a distant past. compared to a real Qianlong period imperial piece (right). The lesson here for the student of antique arms and armor is to always keep questioning. Museums descriptions, books, auctioneers, long-time collectors, they can all be wrong from time to time. Museums in particular are often held in high regard by the layman, but they too make mistakes. Their collections span thousands of items and there is only so much expertise in-house. A curator with a master's on Japanese lacquerware may be appointed in a position where he's head of Chinese arms as well. Some museums do a great job cooperating with experts from many fields to increase their understanding, while other institutions, large and small, find it hard to change something even when it is pointed out to them again and again. It is down to us, the arms and armor community as a whole, private and institutionalized, to keep studying and sharing to raise the level of our understanding. 1. C.J. Peers; Late Imperial Chinese Armies 1520 - 1840 , Osprey Publishing, Oxford, 2005 reprint, page 33. 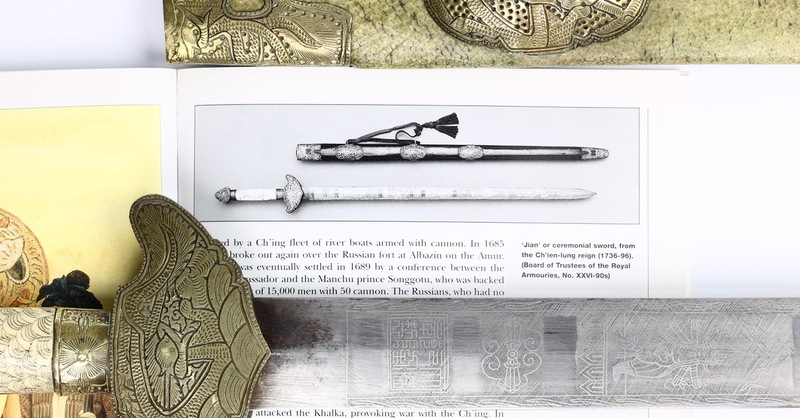 The accession number in the publication is XXVI-90s, which is perhaps an older accession number because today the exact same sword turns up under XXVIS.190. 2. See: Kate Hunt, Demystifying Chinese reign marks — everything you need to know to get started. Materials: Steel, iron, silver, brass, bone. Scabbard: wood, ray-skin, brass. 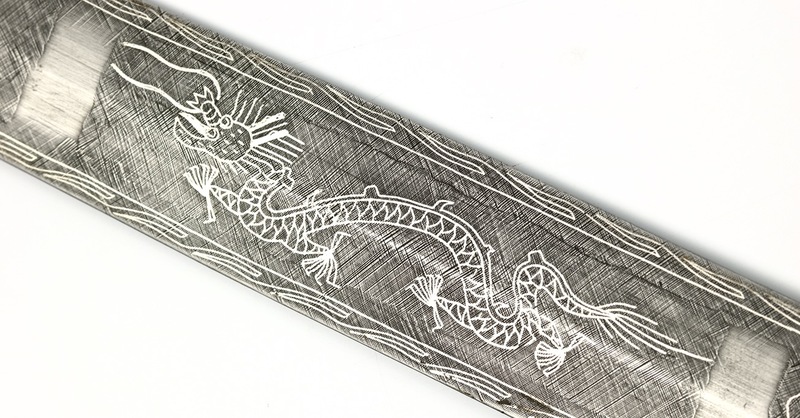 Now we have established what it is not, let's now focus on what it is: An exceptionally large and heavy Chinese straightsword of the late Qing dynasty, possibly even early Republic. For this period, it's actually quite a nice piece. Most were of much simpler manufacture with little to no attempts to decorate them at all. The most striking feature of the piece is, of course, the blade. It is crosshatched to form a background to which silver wire would adhere when hammered on. 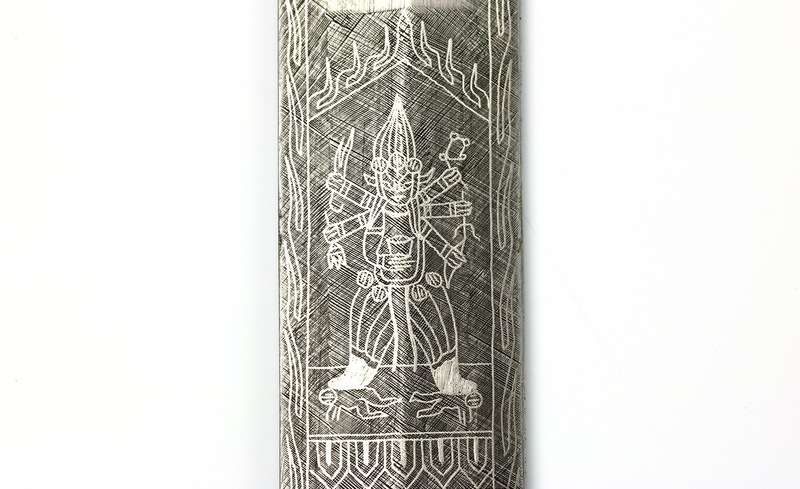 Using this method, the blade is decorated in full with a framing border around its contours. Within the border we find on each side a Qianlong reign mark, two sanskrit characters, four figures, a dragon, and a constellation. 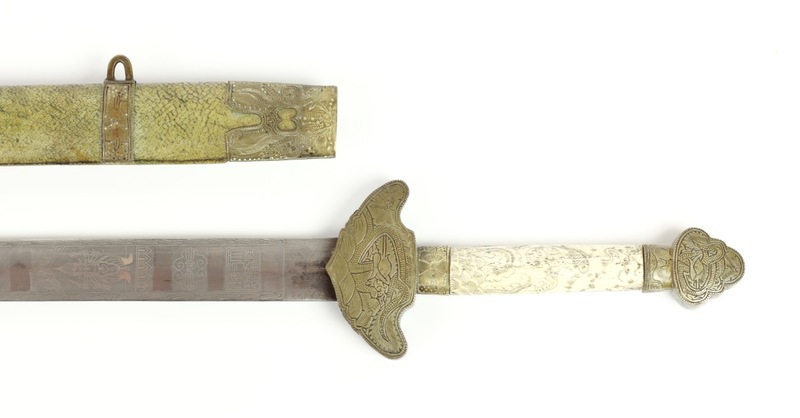 Four figures on one side of the blade are women in Chinese dress that we can identify as the "Four Great Beauties" (四大美女) of Chinese folklore. They were allegedly so beautiful that one, Xi Shi, made fish forget how to swim, Wang Zhaojun made the birds forget how to fly, Diachan eclipsed the moon, and the last, Yang Guifei brought flowers to shame. The four figures on the other side are the probably Heruka or "Blood Drinkers" of Tibetan Buddhism. These are considered enlightened and fierce protectors, known as "Enlightened Kings" (明王) in Chinese. The one on the top is hard to identify. The second from above is easily identifiable as Vajrayana or "The King of knowledge having conquered three worlds" (降三世明王). The third, sitting on a lotus, is probably Yamantaka (大威德金剛) "The Defeater of Death" while the fourth, standing figure is Kuṇḍali (軍荼利明王), dispenser of the nectar of immortality. Near the tip the blade has, on each side, a dragon and seven stars of the big dipper, a constellation that was very important in traditional Chinese thought, among others in Daoism. It represented the seat of the celestial king around which all revolves, and it was the constellation in which the time of death was determined. This constellation is often seen on antique Chinese swords, primarily straightswords but sometimes sabers, spearheads, and other weapons. All in all, the decor is eclectic. The mark of an illustrious emperor, harking back to the most prosperous times the Chinese empire had ever had until then. Four beauties from Chinese folklore. Four fierce deities, protectors of Tibetan Buddhism, a religion practiced by the Qianlong emperor himself and many of his Tibetan, Mongol and Manchu subjects. Add to that constellations most prominent in another religion, Daoism. Finally, a five clawed dragon on each side depicted just like it is on the Chinese flag of the last decades of the Qing. It is almost as if the sword is trying to commemorate "the good old days", a testament of the greatness of Chinese culture in a time that everything was falling apart. 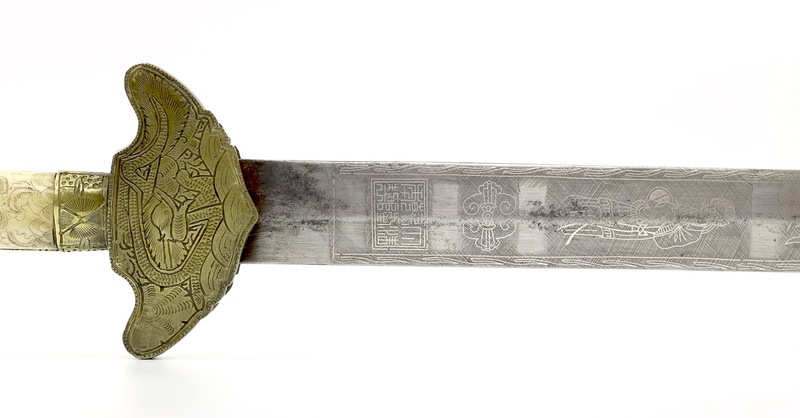 Despite all the decoration, the blade shows hints of a forge-folded construction, possibly with inserted hardened edge, yet was never sharpened. 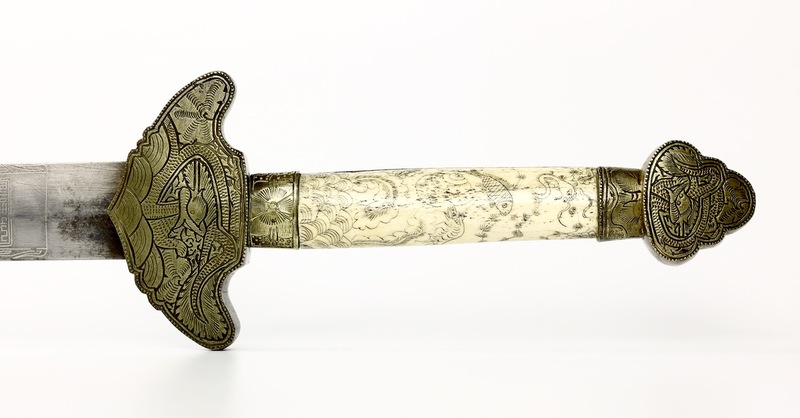 The hilt consists of an "ace of spades" style guard, typical for the late Qing, with matching lobed pommel. 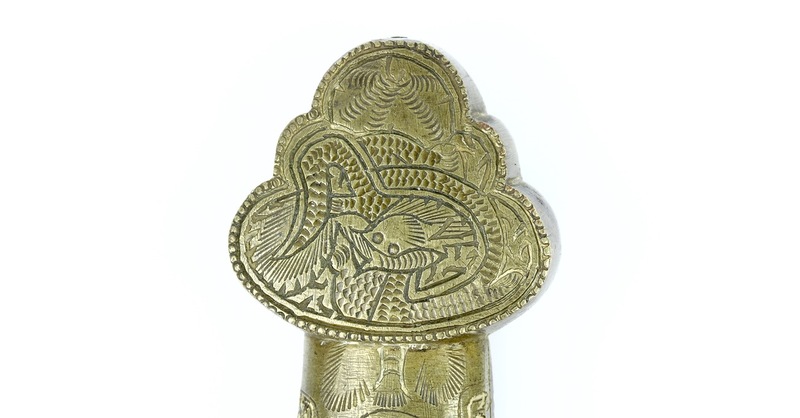 The fittings are engraved with designs of archaic dragons. 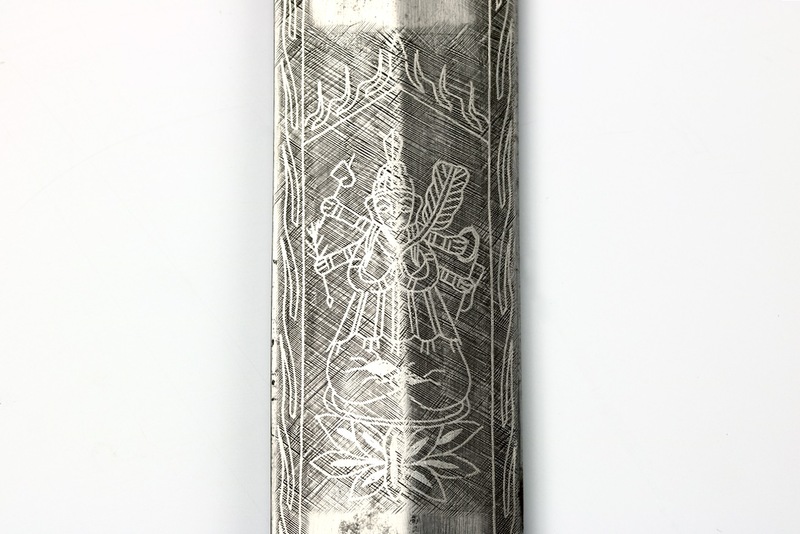 The bone handle is engraved on both sides, one side showing what looks to be a monk in fighting pose, possibly Bodhidharma, who brought Chan Buddhism to China, which in turn spread to Japan and is now known as Zen. The other side shows an underwater scene with fish, snail and shrimp. Original peening at the pommel intact. There is also some play in the handle. 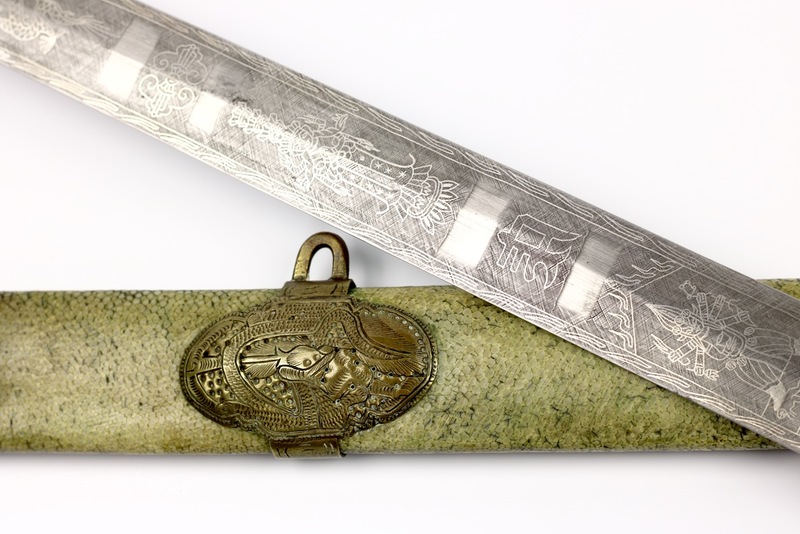 It comes in its original wooden scabbard, covered in ray-skin, dyed green and polished. Ray-skin in great condition, no losses. 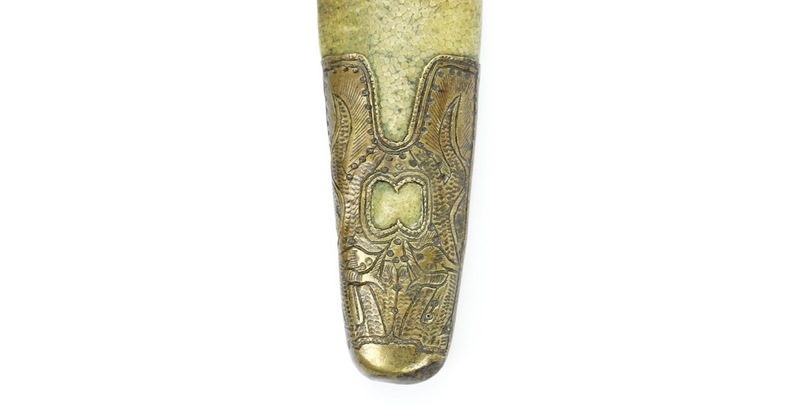 Its brass fittings pierced and with dragon engravings. A section of the band of the upper shield is missing. The most common description given for them is ceremonial, yet to my knowledge the only Chinese ceremony that uses a straightsword is a Daoist ceremony. 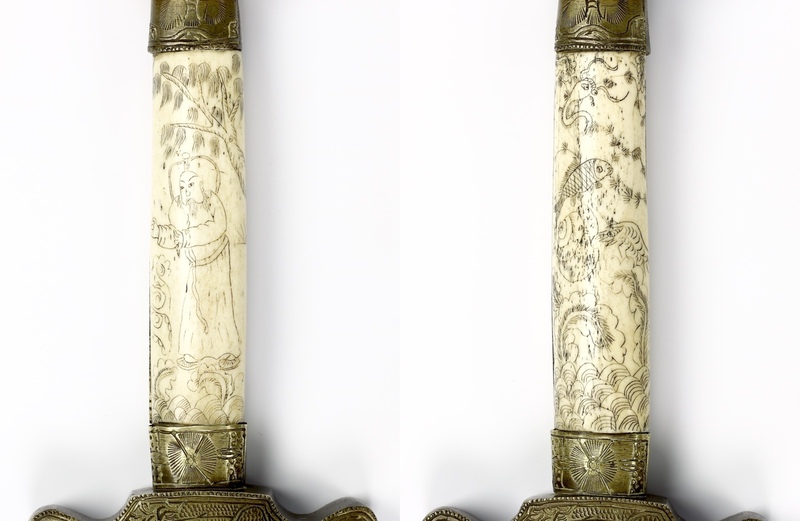 Swords used in these ceremonies typically have a strictly Daoist theme in their decoration. This leads to the conclusion that they were probably made as purely decorative pieces, possibly aimed at a predominantly foreign market. As mentioned, several of these swords, either in sets or as large, single swords, circulate. Most of them are in private hands and those I've tracked have changed hands for as little as $100 and as much as $20.000 in the last decade or so. One nearly identical example, mentioned in the introduction, is in the Royal Armories in Leeds under accession number XXVIS.190. 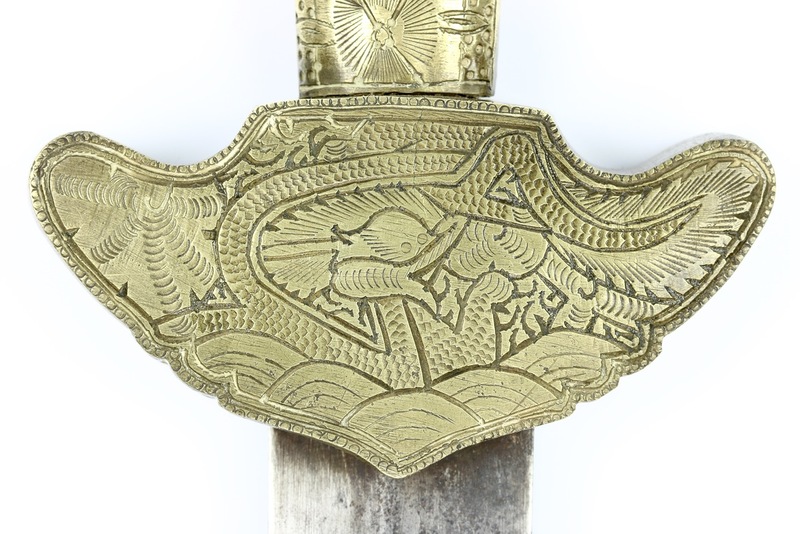 It is remarkably similar, the only difference is that ours has a ray-skin covered scabbard and the one in the Royal Armories has a black lacquered scabbard. 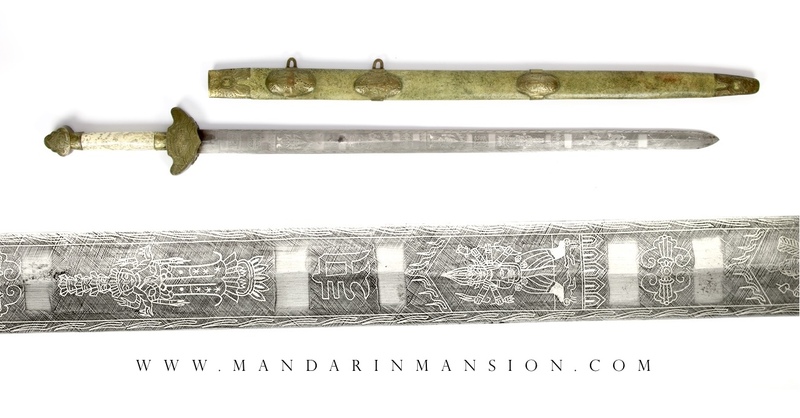 It is still represented as Qianlong era sword on the website and was published in a variety of publications. The Royal Armories note: "There are numerous examples from the same series; for example, those in the collection of Prof. Dr. W Uhlmann, Gerbrunn, Germany, no. 229; Mr M Watts, Crawley Down, West Sussex. " Other notable published examples include a set and a single sword, published in Alex Huangfu's Iron and Steel Swords of China (中國刀劍), pages 208, 209, and the foldout in the back. In this book he describes both the set and the single long sword as "Qing Qianlong period ceremonial court dress swords" (清乾隆款宫廷礼仪佩剑). As evidence for this attribution he makes he reproduces a photo of the Royal Armories example , and a photo of the sign with which it was displayed. 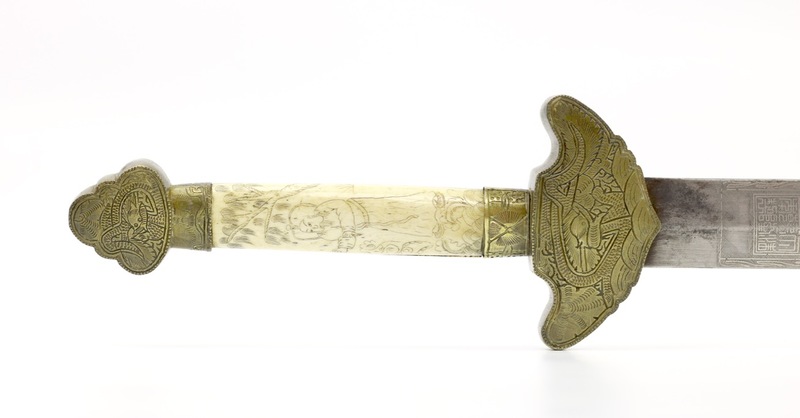 A good, representative example of a type of Chinese sword that is widely thought to date from the Qianlong reign. Its many misrepresentations aside, these are quite interesting items in their own right. It remains somewhat unclear why they were made, but I suspect they were made as presentation pieces for foreigners, or items intended for the curio trade.